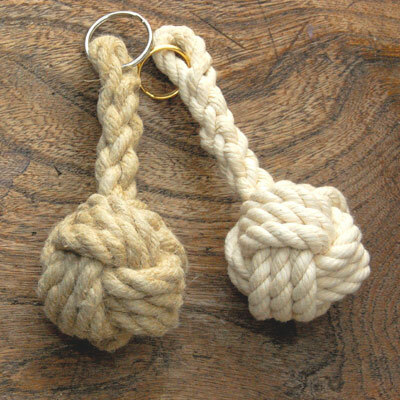 Stonk Knots design in Rope - Monkey fist key rings and more. The Monkey's Fist is made from a single length of rope or cord followed and worked around the traditional pattern. The pattern can be followed around twice, three or more times depending on the size of the monkey fist required, then - using the fid, the rope is gradually and neatly pulled together to make the knot tight. A Monkey Fist knot is a traditional sailor's knot, commonly tied around a stone, lead or glass ball and used at the end of a boat's heaving line as a weight to carry the rope forward when it is cast. The topology of this knot links in three directions, represented as interlocking circles. When tied in the form as illustrated, using a good hard laid rope, it holds its own shape nicely without a core. 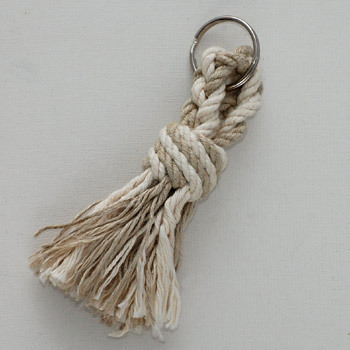 The key-rings shown above were made using new high grade natural fibre rope in 8mm three strand cotton or hemp and measured approximately 6 inches long (15cm). At the long end the rope was looped around a brassed or chromed split ring, and the (unlaid) strands spliced back along the lay. The Monkey Fist knot is not the easiest to master: after the initial pattern is set, the real skill lies in being able to neatly follow the pattern three times around and make a ball shaped knot with no distortion. 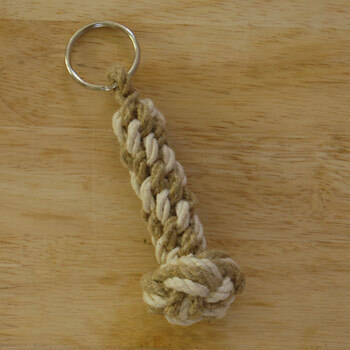 Making a keyring based on this knot is a popular and challenging project to work on for those who are interested in the craft of knotting; we have found it a favourite at our workshops and demonstrations. The Monkey Fist Knot provides a handsome end to a long cord lightpull and makes an original button and loop rope curtain tie-back. The Diamond Knot is a very old knot according to The Ashley Book of Knots - first mentioned in 1769 and originally used in jib-boom footropes. A diamond knot is often tied into the middle of a rope and can be made from two or more strands of the rope. These Double Diamond Knot Key Rings were each made from a single length of 8mm cotton rope which is looped over to create two 'strands'. The pattern of the knot was followed twice around (doubled) and the ends unlaid and combed into a tassel. The length of this keyring is approximately 5 inches (13cm). A more intricate eight strand version can be seen here tied decoratively into a Ship's Bell Rope. The Double Matthew Walker Knot will not slip or capsize. It is an easily formed knot but, like the Star Knot, is hard to set fair. This knot is one of the few knots to be named after a person; The Ashley Book of Knots relates the story of a sailor who was sentenced to death by a judge - himself a sailor in earlier life. Because of their common fellowship of the sea, the judge offered the sailor a full pardon if he could show him a knot that he, the judge, could neither tie nor untie. The fortunate Matthew Walker came up to the challenge, secured his pardon and provided the world with an excellent knot. 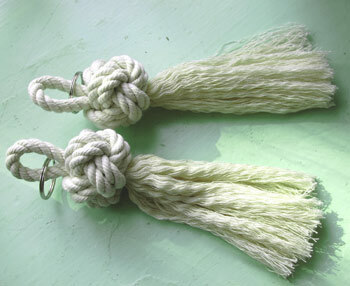 The Matthew Walker shown here used three strands each of 4mm hemp and cotton rope and measures approximately 4 inches (10cm). The Manrope Knot is a smart stopper knot tied into the end of a line which effectively prevents the rope from unravelling. At sea the Manrope Knot was tied in the manropes which lead to either side of the gangway. Using the individual strands of the rope, the Manrope on Crown Sennit Keyring is constructed by forming a Wall Knot, then a Crown Knot on top of the wall, then following round the Wall, then following round the Crown! The keyring shown on the left was made using two lengths of 4mm hemp cord, which were crossed over each other and worked as four separate strands. The Manrope and Crown Key Ring measured approximately 4 inches (10cm). 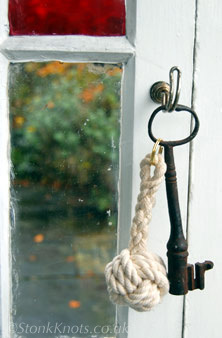 They are still used as practical end knots on a handrail or stair rope. You can see how to put in a manrope knot at the end of a 24mm hemp rope on our working with ropes page.